Dentist Tips for Kids. How to help your children have a positive experience at the dentist. Seven tips to have a successful dentist visit. It can be unnerving to get on your back, open your mouth, and let a complete stranger poke around in your mouth. It is no wonder children and even adults can be afraid of the dentist. There are many things we can do as parents to help our children have a positive experience at the dentist. 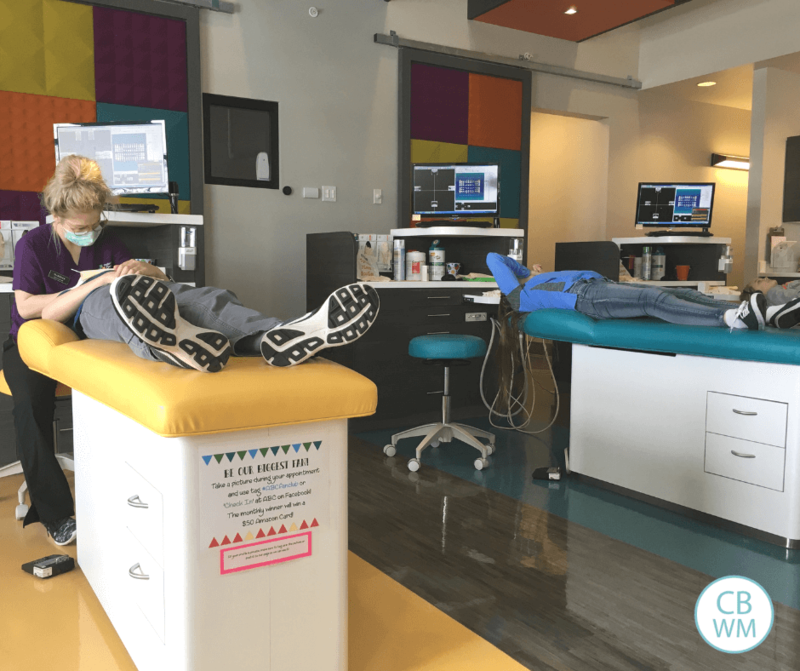 I really wanted my kids to be as comfortable as they can with the dentist. The dentist is a thing twice a year so I want them to be cooperative at those visits. I also want them to be adults who visit the dentist regularly. Prevention goes a long way in dental care, so I don’t want the dentist to be avoided. Here are some dentist tips for helping your children have a positive experience at the dentist. What age should you first take your child to the dentist? The American Academy of Pediatrics recommends your child go by the first birth or within 6 months of the first tooth erupting (read the recommendation here). Being the rule follower that I am, I went for as close to 12 months old as possible. Kaitlyn attended the dentist for the first time at 16 months old. I normally would have taken Kaitlyn to the dentist for the first time at 12 months, but decided to wait because at 12 months, she only had two teeth. Even at 16 months, she barely had five. It also worked out so we were then on the same appointment schedule as Brayden. I would rather take all of my children at the same time rather than them all having separate appointments because they were not born in the same month or 6 months after Brayden (he started our schedule since he is the oldest). A one year old can be nervous, but starting young means the child gets experience with it from a young age before the cleanings really NEED to happen. This age recommendation is probably the most controversial of all of my dentist tips for kids. Some people really feel strongly kids should wait until age three or so before visiting the dentist. I am all about start as you mean to go on, so I like start at age one. We go to a pediatric dentist. Our family dentist is a great dentist and I think he would do well with kids, but the fact that a pediatric dentist is required to go to school for three more years after graduating dental school made me decide I prefer the pediatric dentist for children. The office is fun and colorful. The staff is accustomed to working with kids all day long. The dentist and staff choose to work with little kids, so they must have some like for children. Also, the pediatric dentist looks at teeth starting at 12 months, and they start real cleanings with real tools somewhere from 2-3 years. The family dentist often only has them sit on the chair for the first three years to get them comfortable with it. One tip I would give for going to the dentist is to know what will happen that first trip and practice accordingly. This is my favorite of all my dentist tips. With Brayden, I really had no idea what to expect the first time. He was pretty scared because he had no idea what was happening or why. With Kaitlyn, I knew the procedure and was able to practice with her at home before we went. She was still scared, but a lot less scared than Brayden was for his first visit. I do dentist practice at home the few days leading up to the visit throughout the toddler and preschool years. I have the child lie on the floor and open her mouth. I get a toothbrush and pretend I am the dentist and dental hygienist. This gets the child used to being in the position and having a person lean over and and work in their mouth. Another tip is to make the appointment for the best time of day. What time of day is your child most agreeable and happiest. I made the mistake of having the Kaitlyn’s first appointment ever start at 10 AM. I don’t know what I was thinking because Kaitlyn’s nap started at 9:45 AM. Luckily she is so easy going it wasn’t a big deal. Also, we got there about 20 minutes early and they took us right in. However, from that time on, I was careful to be sure I didn’t schedule visits over nap time. That is just setting your child up for a meltdown. Another tip is to be compassionate. Your baby up through child doesn’t know what is going on. Kids can be nervous and scared even when they have been many times. Tell them you know they are scared but it will be okay, it won’t hurt, and you are right there. Hold their hands and talk to them/comfort them. Have them look into your eyes, sing a song…whatever it is that works to ease your child’s fears. Also, call in reinforcements if needed. When my children were all young, I always had two adults at the visit (so long as I had more than one child there). If you have a baby not having a visit, it can be good to either get someone to stay home with the baby or have that second adult there so if the toddler has a meltdown, someone can hold the baby while another adult helps the toddler. I have had my mom come or my husband. Having a second adult is great because you never know if more than one child will need something at the same moment. Also, if they work on the children at the same time, then an adult can be with each child. I have seen many outbursts at the dentist over the years. My kids haven’t had major outbursts, which I attribute largely to our practice at home. 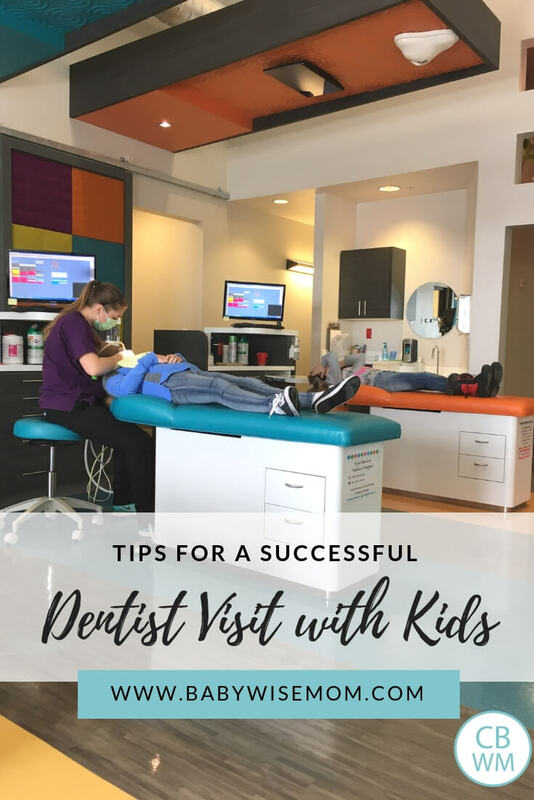 Some of my kids cried at their first visit, which really was perfect because then their mouths were open allowing for a quick cleaning and check up. I have seen 4 year olds walk into the dentist and refuse to be seen, so they just weren’t. I know parents who wait until their children are 4 or older for the first visit because they know their child wouldn’t sit and open their mouths. When Brayden was three, Brayden told me he didn’t want to have his teeth cleaned. I said, “I know you don’t want to, but you need to.” He opened his mouth and let them clean. Once they got started, he was fine and thought it was fun (it tickled). It struck me how much easier dentist and doctor visits are for me because my kids are accustomed to being required to do things even if they don’t want to. They are accustomed to obeying Mommy, and they trust me to put their well-being first. The dentist is no different from cleaning up at home or coming when called. So with that in mind, my final tip is to work on obedience at home. 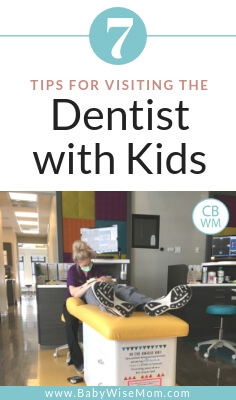 You will have a much easier time at the dentist if your child does what he needs to even if it isn’t fun and even if he doesn’t feel like it at the moment. Follow these dentist tips for kids to have create a positive association with the dentist for kids. Start early and keep your trips regular, and your child will learn that the dentist is not a scary place to be. It won’t necessarily take all nerves away, but at least the experience can be overall a positive one. I just left my first comment on your lastest post, but found this one and love it! I’m a dental hygienist and I cant tell you how upsetting it is for parents to bring in their kids and let them decide if and when they will obey and let us clean their teeth. Its a necessity to take care of your childs teeth and some parents border on neglect of their kids because they dont want to upset them. My aunt actually did that. Her child liked going to bed w/ a bottle (AWFUL!) and so she let her. Her child didnt like having her teeth cleaned, so she didnt make her.. by the time the dentist got a good look at her teeth, she had terrible primary decay and prematurely lost some teeth. The dentist really can be fun when you get your kids used to it when they DONT have problems… not so much if you wait till a tooth is bombed out! And LET THE DENTIST TAKE XRAYS of your child. Not when they’re 12 months, of course, but at around 4 years old. Its the ONLY way to detect decay between the teeth (where the majority of cavities start). Great post!